If you believe it's time to switch from a conventional battery to a an affordable battery that offers the best value for the money, then the 200AH luminous battery prices is all you need to move on with. Lumonous 200AH battery is a perfect fit for your inverter if you don't wish to waste time any longer.On Solaroid Enegy we present you with the best luminous battery price for inverter; i.e. 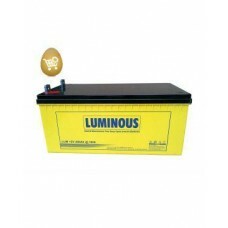 The Luminous 200AH battery that is designed as an Environmental Friendly & user friendly deep cycle battery, Our luminous battery prices are very affordable and the Lumonous 200AH battery we sell gives you dependable & lasting performance without hassles. The 200AH Luminous battery is one of the best and most affordable luminous inverter battery prices in the market that features an absorbent Glass Mat (AGM) technology for efficient gas recombination of up to 99% & freedom from electrolyte maintenance. Get this innovative luminous battery prices on Solaroid Energy at the best price. The 200AH 12V Luminous battery comes with one year manufacturer’s warranty and it offers the best value when compared to other luminous battery price for inverter. Don't wait any longer; get an affordable 200AH 12V luminous battery price for inverter and enjoy uninterrupted energy back up for all your home appliances. The Mercury 12V 100AH Baatery- is an Absorbant Glass Mat (AGM) technology 100AH inverter battery man.. If you cant wait any longer to get the best quality deep cycle inverter batteries that offers the be.. The Mercury 3kVA Inverter is an ideal 24V inverter choice for small Offices and Homes look..